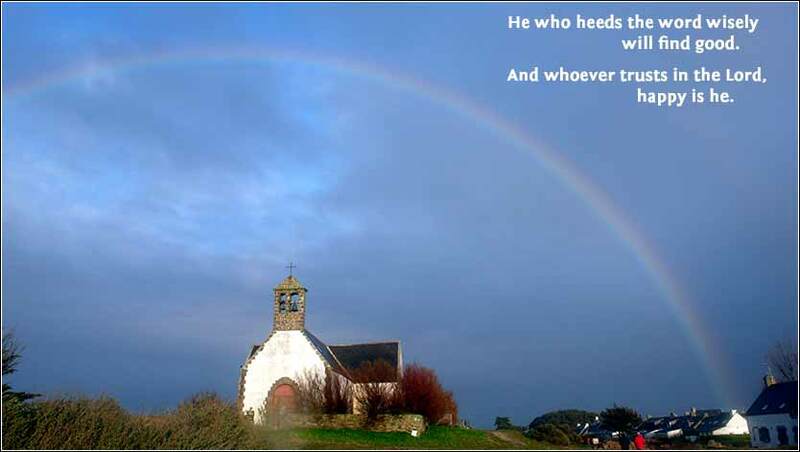 A rainbow above Notre-Dame-la-Blanche, a church on the “magical” Island of Hoedic, in France. The quote is from Proverbs 16:20. 546 people in our community are currently praying with you. Who will love me for me. She's the woman whose husband has run away. He's waiting to die as he sits all alone. He's a man in a cell who regrets what he's done. "Oh Lord, forgive me, I want to go home." And now that you'll listen I'll, I'll tell you that I..."
Music and Lyrics by JJ and Dave Heller. Dear Lord, I am trying to do better and better each day; I am trying to walk with you and do your will, but sometimes it seems like I am slipping backwards no matter how hard I try. And I get confused sometimes; even if I want to do the right thing, I don't always know what it is. God is not silent. It is the nature of God to speak. The second person of the Holy Trinity is called "The Word". Having given us the comfort of knowing that God is our Father, Christ now asks us to recollect how different God is from us. We are not equipped to actually understand God as He is; we cannot comprehend His existence. So Christ tells us how to comprehend him within the framework of our mind and experience. The word “hallowed” we understand to mean holy, something to be revered, which is accurate. It is an acknowledgment that we approach God in total reverence. But more specifically, the term “hallowed” comes from a root word meaning “separate” or “different”. We were made in God's image, but we are not God, or gods. There is evil within us and, thus, evil in our world. God is different. So we celebrate and respect that God is different from us and hold his “name” holy. But what does this mean, the name of God? It means something more than simply the word by which we identify someone. Consider a random use of the word name by the Hebrews: “Those who know your name put their trust in you.” (“Psalm 9:10”) Or here's another good one: “Some take pride in chariots, and some in horses, but our pride is in the name of the Lord. ” (Psalm 20:7) The psalmists are not claiming that everyone knowing the word “Yahweh” puts their trust in God, or that a word is similar to a horse. Rather, “name” connotes that we know something about the nature and character of the being identified. It is a symbol. Carl Jung defined a symbol as an object that stands for something that cannot be made clear or precise, and which may have layers of complexity. God's name does not refer simply to a word. It is a testimony to His existence. It is an invocation of His holiness. But what actual word do we use for the name of God? Most of us understand the word “God” as the name of God (and also Jesus Christ, which is an actual name). Keeping them separate from all other words, as symbols of a holiness we can understand only dimly, acknowledges our duty under the Second Commandment: so, the Lord's Prayer reminds and reinforces our commitment not to use the words God or Christ in any abased sense, notably, not as swear words. Some Christians, like people of most religions, sometimes surround themselves with all sorts of symbols and then revere them, while others reject the practice as idolatrous. But one thing is certain: Christianity is a religion of belief in the Word, and it is appropriate that a word is the one thing Christ requires us to treat as separate and holy. 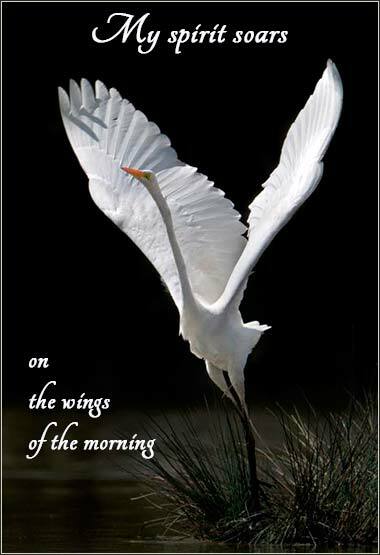 “The Wings of the Morning”, from Angels Still Fly by Velva Barnes.